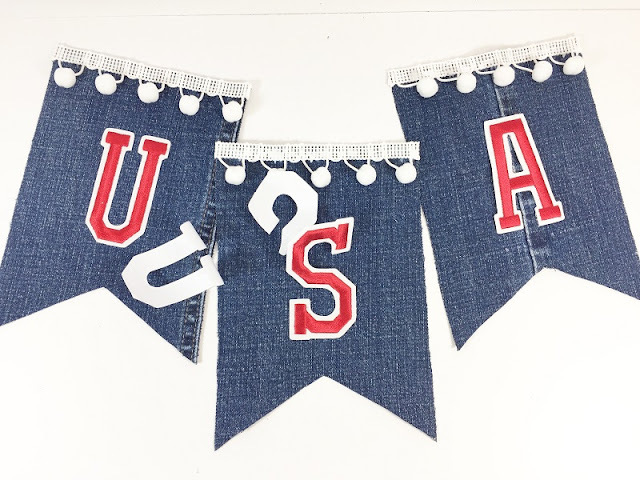 I am excited to share my patriotic upcycled denim "USA" banner project - perfect for the upcoming Fourth of July holiday. This banner is easy to make in under an hour and would be a fun project to complete with the kids. I am always saving ordinary, everyday objects and upcycling them into craft projects and home decor items! To create a banner template, I used the cardboard backing from a junior 5x7" legal pad. Measure up 2" from the bottom and 2.5" in from the side to determine the center. Draw a straight line with your ruler from that center point out to each corner. 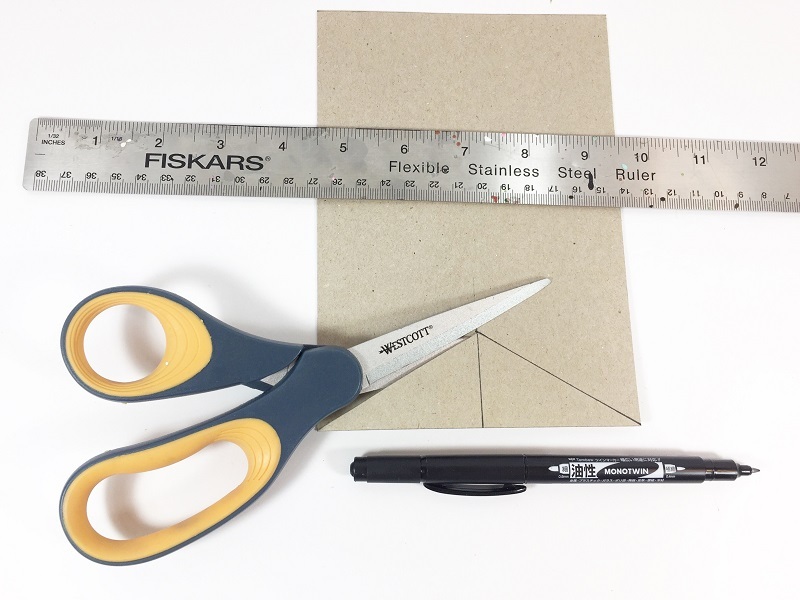 Cut out with scissors to create a quick banner template that you can use over and over again! 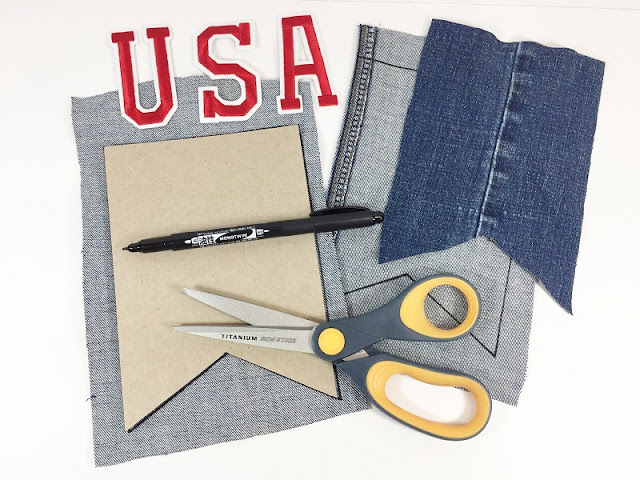 Use the template to measure and cut an 8" length from an old pair of denim jeans. 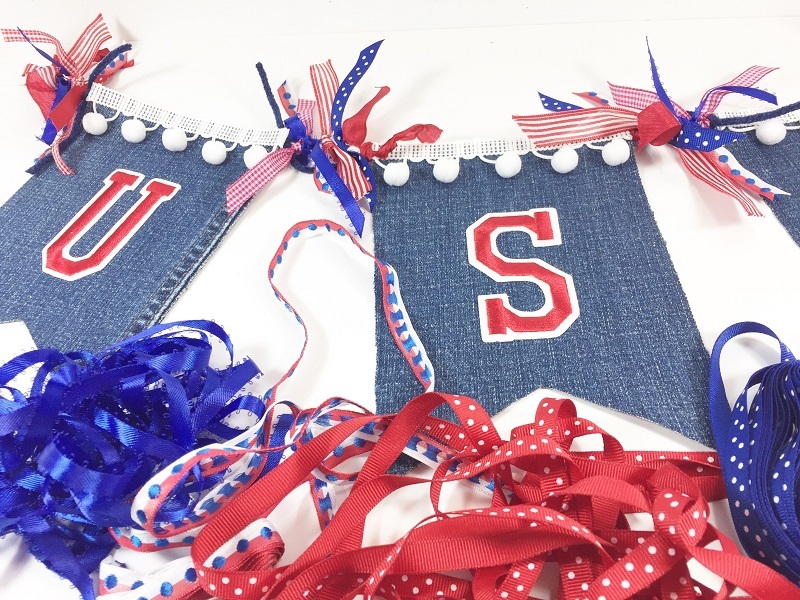 Open the fabric flat by cutting up the seam, then trace and trim out three pennants for this "USA" banner. 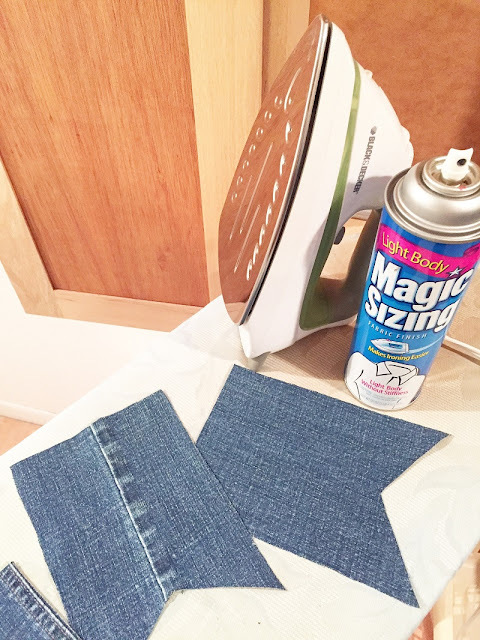 Upcycled denim projects should not be wrinkled, so smooth out the denim pennants with some spray starch and a hot iron. I selected the self-adhesive red and white 3" collegiate-style embroidered letters for this project. Since they are self adhesive, all you have to do is peel and stick, no ironing! Measure, cut and glue three 5" lengths of trim to the top of each banner. Add a little glue to the ends of each piece to prevent fraying. Glue each pennant to a 3-foot length of white ribbon, leaving 2" between pennants and 8" at each end. I like to use a woven type of ribbon for this, such a gross grain or cotton twill tape for durability. The final step is to embellish the banner with some festive ribbons between the pennants. I used what I already had in my ribbon stash, cutting 8" lengths and tying them in knots. You could also add textured yarn, tulle and metallic fibers for some bling! A great way to use up scraps! 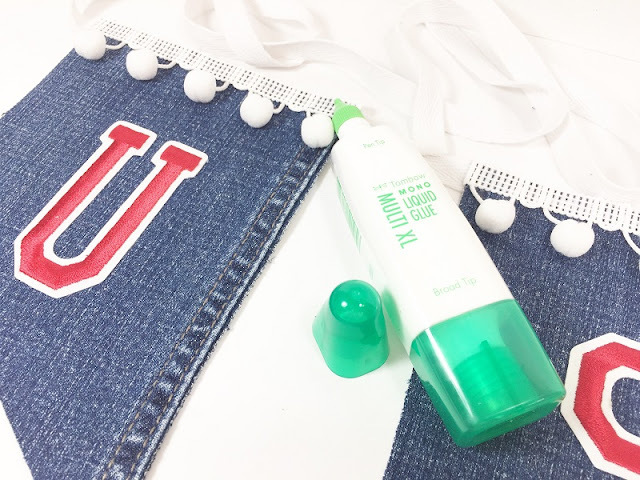 Change up the letters to create your own, personalized message - the possibilities are endless! 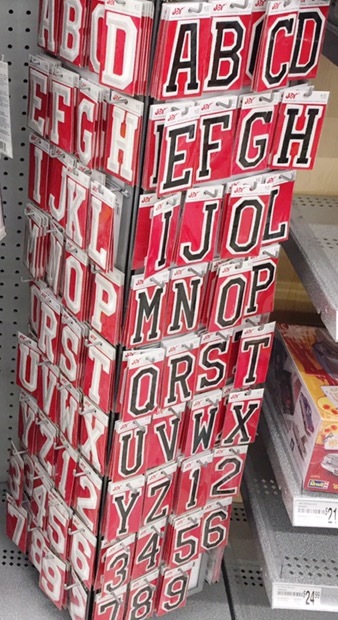 The great part about these larger Joy letters is that they are packaged individually, so you can purchase just the letters you need to create your message! 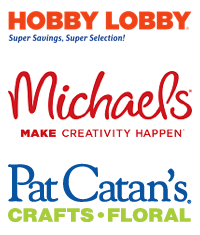 Joy embroidered letters, numbers and symbols that can be found at your favorite craft store! 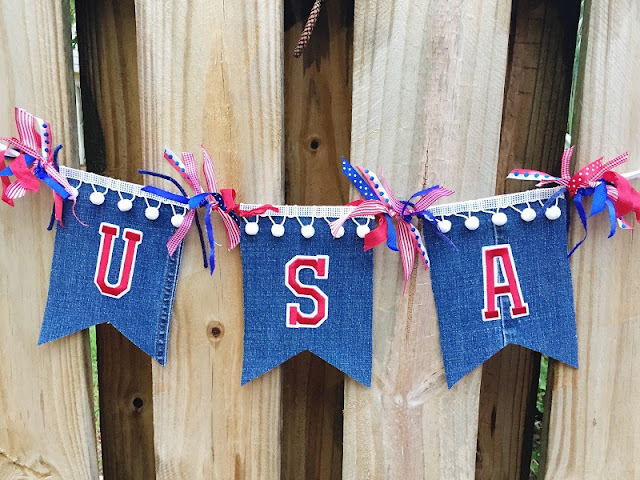 I hope you have enjoyed my patriotic upcycled denim banner! Use my project as a jumping-off point to showcase your creativity with Joy letters, then share it on on our Facebook page. Change up the letters to create your own personalized message - the possibilities are endless!